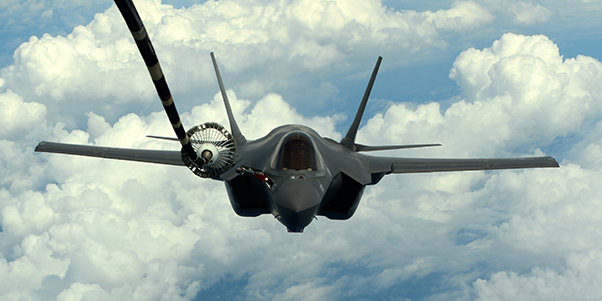 A U.S. Navy F-35C Lightning II is drogue refueled by a KC-10A during a training mission near Eglin Air Force Base, Fla., April 10, 2015. The ground test evaluated two types of lights with different color tones – a warm white light and an amber light – across various brightness levels. 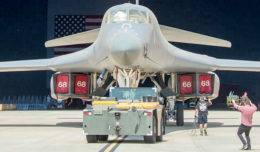 The warm white light was assessed as the best choice for both of the boom operators and the pilots, McGee said. The first flight test lasted four hours and accomplished all of the required test points. 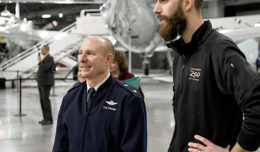 The evaluation had favorable results and the design will now be considered by the Air Refueling Certification Agency to be incorporated into a revised flight clearance for the Navy and USMC, anticipated by early this summer. 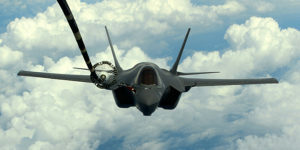 The F-35A — the U.S. Air Force variant — does not have a probe so no light change is required for that model.